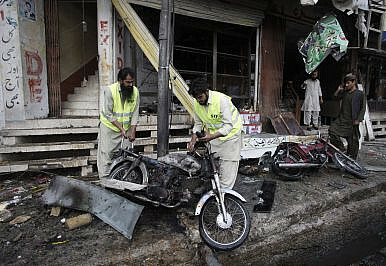 Rescue workers remove a motorcycle from the site of a bomb blast in Quetta (May 8, 2014). China’s push to materialize its “One Belt, One Road” dream in South Asia demands empirical study of the political role Beijing envisages in the region, especially in Pakistan. China’s western neighbor, Pakistan, was one of the the first countries where China began its OBOR project, under the framework of the China-Pakistan Economic Corridor (CPEC), a series of projects that stands to connect the Asian giant to Central Asia and Europe in the long run. CPEC will connect China’s largest province, Xinjiang, with Pakistan’s Gwadar port in Balochistan, the largest and most impoverished province of Pakistan. Balochistan has been under attack by separatists, insurgents, and Islamic militants – now including the Islamic State (ISIS) – for over a decade. Today, the main questions that arise from the continue violence are twofold. Who is causing the unrest? And who will benefit? Violence in Balochistan: A Conspiracy Against CPEC? In February 2013, Pakistan awarded operational contract of Gwadar port to China amid American pressure to look for alternatives. This port is a linchpin for China’s dream of OBOR, providing the Maritime Silk Road with a link to the Arabian Sea. The port at the mouth of the Persian Gulf provides China with the shortest route to the oil rich Middle East, Africa, and most of the Western hemisphere. Gwadar will have the estimated capability to handle to 19 million tons of crude oil per year, which will be sent to China after being refined at the port. The attraction of Gwadar port is the main reason for China to build a 2,000 km of road and rail infrastructure worth $10.63 billion in Pakistan, stretching from Gwadar to eventually connect with Kasghar. Moreover, a network of gas pipelines will be set up to finally connect Pakistan with Iran. Tehran has already completed its part, as per a 2013 deal, and is waiting for Pakistan to finish its section. This was originally envisioned as a so-called peace pipeline among Iran, Pakistan, and India but it now seems China will replace India and feed its energy hungry industry with Iranian gas. India greatly opposes the proposed CPEC route and development at Gwadar port mainly for two reasons. First, the planned route passes through the controversial territories of Gilgit-Baltistan and Kashmir between India-China and India-Pakistan respectively. Second, India fears that Gwadar will double as a Chinese naval base. Despite clarifications from China and Pakistan that the port will be used only for economic purposes, India is still wary of developments in Gwadar, fearing that it will give the Chinese navy access to Indian Ocean. Mirroring previous statements, India’s foreign minister in a recent meeting with her Chinese counterpart stressed that India would “resolutely oppose” CPEC because it passes through Pakistan-administered Kashmir, which India claims to be its territory. Last year, India’s prime minister termed the corridor “unacceptable” for the same reason. As a substitute to Gwadar, India has invested in Iran’s Chabahar port, just 72 km from its rival port. In May 2016, India, Iran, and Afghanistan signed a trade corridor deal giving India land access to Central Asia from Chabahar, bypassing Pakistan. The closest land route for India to access Central Asia is to the west, through Pakistan; however despite many bilateral efforts the two countries have yet to reach an agreement that would allow Indian trucks on Pakistani soil. Therefore, as an alternate though longer route, India will access Iran’s Chabahar from the sea, and from there its goods will enter Afghanistan and eventually Central Asia and Russia. Moreover, Afghanistan will now have access to Indian Ocean, which was not possible without passing through Pakistan earlier. What do these grand geopolitical plans have to do with Balochistan’s militant and separatist movements? According to Pakistani officials, everything. Andrew Small, in his book The China-Pakistan Axis, maintains that the biggest concern for the Chinese is growing terrorism in the region, especially in its most trusted ally Pakistan, where Beijing has agreed to invest $46 billion for CPEC. That means a rise in violence may be the most effective way to scare Beijing off the ambitious plan. And Islamabad has repeatedly accused India and other foes of CPEC of fomenting attacks with just that goal in mind. However, Islamabad offered no statement regarding an official document issued in July, which stated that 1,000 bullet ridden corpses were found in Balochistan during last six years. This discrepancy gives a clear indications of what concerns government the most in the province. The Pakistani government claims that Baloch separatists receive training in camps in Afghanistan established by India. Balochistan also borders the tribal area of Pakistan, where forces are combating Islamic terrorists with their own links to Afghanistan. Historically, the separatist and anti-state elements in Balochistan have also been linked to Afghanistan and India. In 1970s, Afghan President Daoud Khan established militant camps in his country to train Baloch separatists. This continued to be the case until President Hamid Karzai’s government, when he assured Islamabad that Afghan soil would not be used against their neighbor. However, Pakistan continuously accused the Indian embassy in Afghanistan of funding militants against Pakistan. The recent wave of terrorism in Balochistan has brought this blame game back. The Pakistani leadership has publicly accused India and Afghanistan of involvement in insurgency and terrorism in Balochistan for decades. Interestingly, now it has also linked such activities to Iran, whose Sistan province borders Balochistan. The only land route that connects both countries travels through these regions. Pakistan is not happy with growing bilateral ties between its old rival India and old friend Iran, especially given the potential impact on CPEC. On March 25, while Iran’s President Hassan Rouhani was on his maiden foreign visit to Pakistan, law enforcement agencies disclosed the arrest of an alleged RAW spy, Kulbhushan Yadav. Pakistani authorities claimed Yadav had entered Pakistan from Iran and was actually arrested on March 3. The Indian government admitted that Yadav was a former naval officer, but denied any involvement with him. Pakistan’s government claimed that he was an “Indian spy” assigned to sabotage CPEC, especially Gwadar port. However, both Iran and Pakistan clarified that the incident would not derail friendly ties between the two, saying the case would be probed and both sides would cooperate. Despite all the optimistic statements from the foreign offices of both countries, the Iranian president’s visit ended in vain. Pakistan asserts that India is bent on sabotaging CPEC by funding and training anti-state elements in Balochistan. The claim is supported by India’s official concern over CPEC and a potential Chinese naval base in Gwadar to ensure Chinese maritime hegemony in Indian Ocean. On India’s 70th independence day, Prime Minister Narendra Modi added fuel to the fire. In his address to the nation, Modi said that Kashmiris and Balochs alike have thanked him for raising concerns regarding human rights violations by the Pakistani state in these territories. Pakistan termed the remarks as a proof of Indian meddling in its territory. The U.S. Congress has also expressed concerns regarding human rights violations in Balochistan, making Pakistan wary of an intrusion into the Islamic Republic’s internal matters. Further, on the geopolitical stage, the United States is more supportive of India’s “Look East” policy than China’s OBOR and in past, Washington had proposed its own “New Silk Road” connecting South and Central Asia. The U.S. House of Representative Committee on Foreign Affairs convened a congressional hearing on Balochistan on February 8, 2012. At the hearing, it was argued that Balochistan is under siege by the federal government and rights of the Balochs are restricted. Pakistan’s military was also accused of using “American arms” against their own people in Balochistan. The event’s chair, Dana Rohrabacher, has advocated for self-determination in Balochistan, even up to independence. As a result, Pakistan decried the Congressional hearing as direct interference in its internal affairs. Given the U.S. track record of meddling in the internal affairs of many countries under the guise of human rights, Islamabad assumes that the U.S. agenda in Balochistan is far greater that just human rights violations. The United States, as a stabilizer of the balance of power in Asia, has backed India as a potential competitor with China. The rivalry visibly surfaced when U.S.-backed India failed in its bid to be included in Nuclear Suppliers Group over Chinese opposition. India held China solely responsible for its failure. Decades ago, the looming threat of Soviet expansion in the warm waters of the Indian Ocean convinced Pakistani Prime Minister Zulfiqar Ali Bhutto to offer President Richard Nixon the chance to establish a U.S. naval base at Gwadar. The idea was also supported by China. But apparently Washington could not understand the importance of the port — until China took it over. The port will open gateways for China to destinations where the United States is already present or intends to maintain its hegemony, including Central Asia and the Gulf States. Among all the speculations, apprehensions, assumptions, and accusations, Balochistan remains at the center. For a successful CPEC and a peaceful South Asian region, Balochistan’s importance has grown beyond all estimates. It is in the best interest of all stakeholders, especially the host country, to sensibly deal with the prevailing circumstances in Balochistan. If this “sweet melody” is to entertain all, all stakeholders must make peace in Balochistan their mutual responsibility. Usman Shahid is a Lahore based academic and regional policy analyst. He is co-author of the book Indo Pak People to People Contact: A Victim of National Insecurities.